Home Tags Articles tagged with "teachers"
Average teacher pay at Maricopa Unified School District according to budget numbers. Salaries actually vary widely depending on each teacher's experience and advanced education. 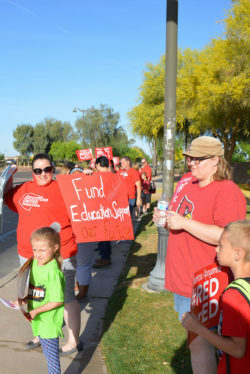 Teacher raises and competitive compensation plans for new employees are included in the proposed budget approved for Maricopa’s public school system Wednesday. Maricopa Unified School District’s $54 million budget for fiscal year 2018-19 was unanimously approved June 28, but Governing Board Vice President Gary Miller questioned whether the district could realistically maintain those salary increases included in the compensation plans beyond this school year. Human Resources Director Tom Beckett argued increased enrollment growth projected in the district and commitment from the state Legislature as two funding sources. Gov. 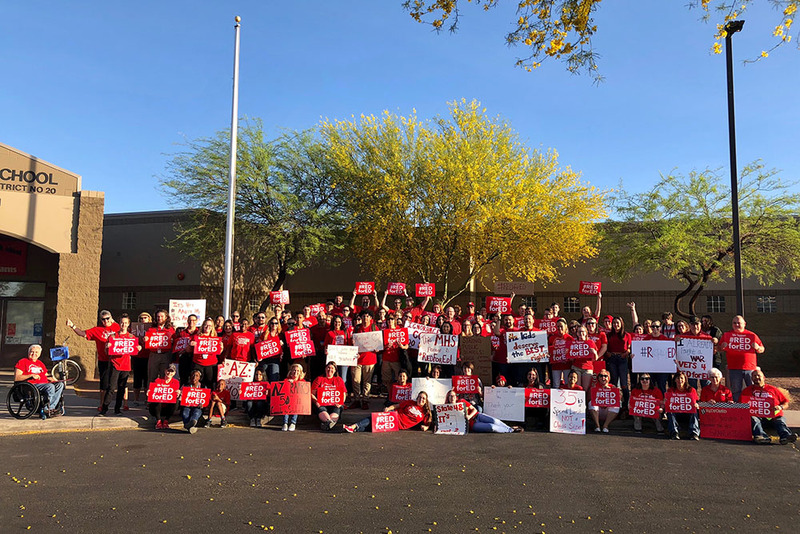 Doug Ducey approved this year funding to Arizona school districts that would allow up to a 10-percent pay increase for teachers after educators held walk-outs in the #RedForEd movement. Teachers are also slated to receive an additional 10-percent increase by 2020 from the state. MUSD received more than $1 million from the state this year for teachers, but the board approved raises for administrators, classified staff, transportation and employees in health and related services at a cost to the district of about $2.6 million. Future funding from the state will have to be approved during annual budget sessions. “So, what I’m hearing from your prediction is that the Legislature will keep their promise and, between that and our growth projections, then this will be sustainable?” Miller asked. Beckett said he couldn’t give that assurance but speculated that even if the state backed off from its commitment to continuously increase teacher pay, funding from the district’s swelling enrollment would likely cover the loss. Administrative and classified employee raises this year are covered almost entirely by enrollment dollars alone, Beckett said. Beckett predicted the new compensation plans for future employees will attract and retain teachers. Under the proposed 2019 budget, the average salary of all teachers will be $47,748 – an increase of more than $4,000 from last year’s average. “I think this will position us, at least for the next few years, to go to places like California, the Midwest, and be able to present a real salary that is going to be attractive to our people, especially to our teachers,” Beckett told the Board. The budget also allows for the purchase of one regular route school bus and a special education route bus. A public hearing will be held during the Board’s next meeting July 11 before the final budget is approved and forwarded to the Arizona Department of Education. Schools in the Maricopa Unified School District could close late next week after teachers voted to approve a statewide walk-out. 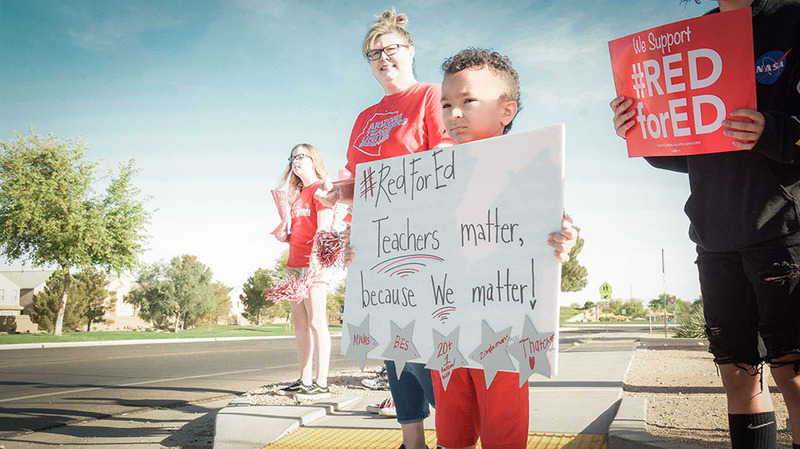 Leaders of the #RedForEd movement announced Thursday evening the walk-out is slated to begin April 26 following three consecutive days of walk-in events that week. 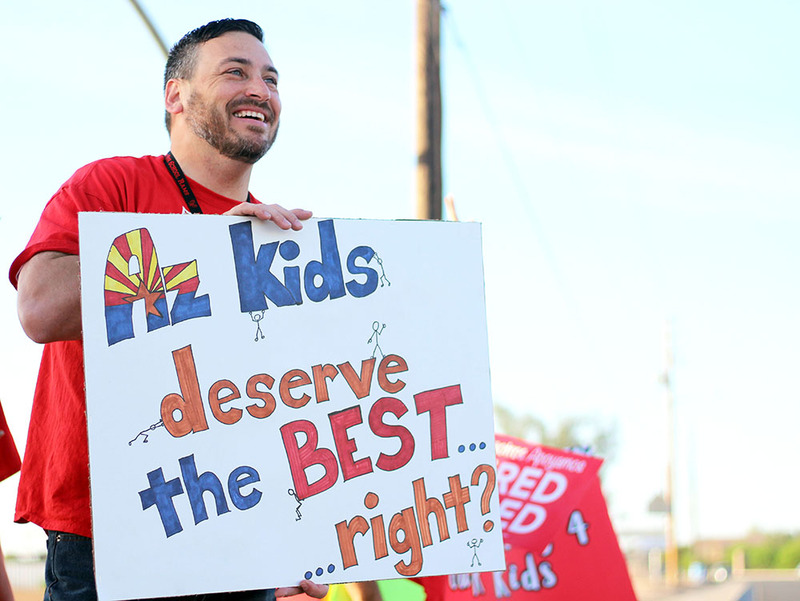 Arizona Education Association and Arizona Educators United collation have not placed a limit on how long the walk-out will last. Educators voted on the matter this week and the results showed they “overwhelmingly support” a walk-out, according to the AEA and AEU. AEA President Joe Thomas said in a press conference Thursday evening that 78 percent of the 57,000 votes cast supported a strike. The vote comes after widespread rebuke from the Arizona education community regarding Gov. Doug Ducey’s budget proposal last week which he said would increase teacher salaries by 20 percent – including the one percent raise approved last year. 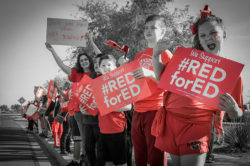 Arizona Education Association and Arizona Educators United coalition have criticized the proposal as hastily presented and shortsighted. Educators in the trenches argue the movement is about more than just teacher salary, but also increased compensation for support staff and per-pupil funding among other issues. 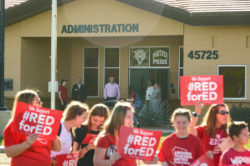 Walk-out information was posted to the MUSD website Thursday evening ahead of the highly anticipated announcement by the Arizona Education Association and Arizona Educators United coalition. Parents will have to utilize alternative child care in the event of a walk-out, according to the document. Any days MUSD schools are spent in closure will have to be made up at the end of the school year. You may be aware that many of our teachers and staff have been participating in statewide efforts to increase awareness for teacher and staff salaries and the need for additional public education funding. These efforts have included a rally at the State Capitol, social media campaigns and peaceful walk-ins to schools each Wednesday morning. Staff are organizing independently and on their own time. We respect our teachers and staff in their unity efforts and appreciate that they are non-disruptive of the instructional day. 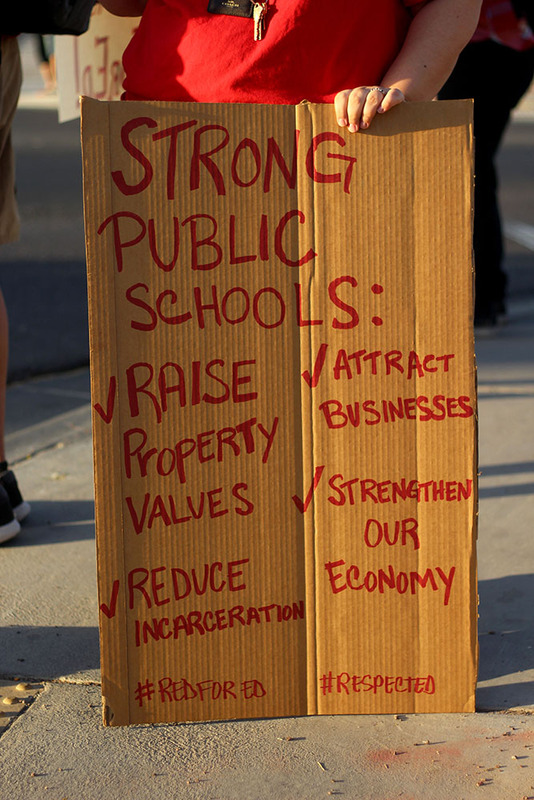 We want to make you aware that there is the potential for teacher walk-outs across Arizona. No decision or date has been set by the organizers, but as a district we are working to determine the impact on school operations. In the event of a work stoppage, we would more than likely close the schools and do everything we can to provide you with advanced notice. We will use our ConnectEd notification system to get information to you. Please make sure that your phone numbers and email address are current in our student information system. We are fortunate to have a community that consistently supports our schools. We appreciate our dedicated employees who continue to focus on meeting the needs of our students. And we appreciate all of you and your support of our schools while these statewide actions are under way. The movement to increase teacher pay and improve education for Arizona students continued April 11. Teachers participated in walk-ins at eight schools in the Maricopa Unified School District. Hundreds of teachers, parents, students and community members held homemade signs and marched along busy sidewalks closest to campus. The protests typically lasted 30 minutes. Afterward, teachers entered their classrooms upon contract time. However, today’s statewide demonstration that did not disrupt the school day could evolve in the coming weeks. 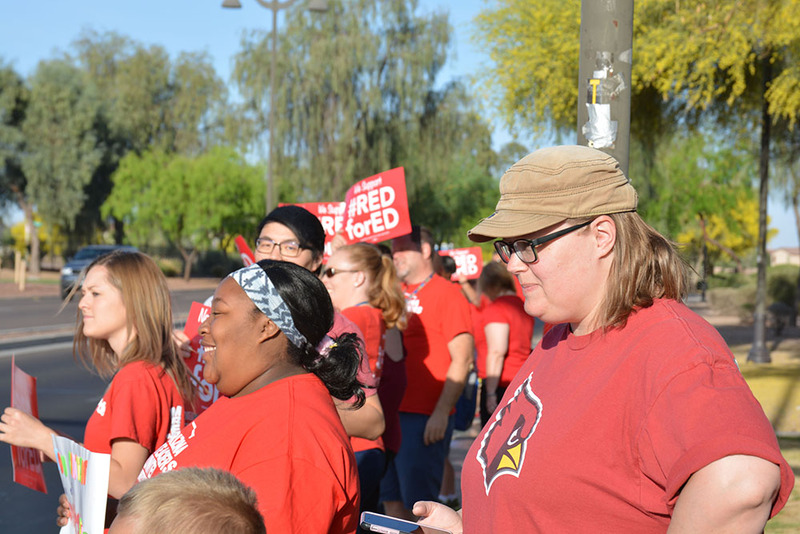 Coalition leaders with Arizona Educators United prepped Arizona teachers for an impending walk-out in a video posted to Facebook April 9. AEU is expected to announce a walk-out date later this week or next. “If your district does not have the superintendent support or the school board’s support, you may not be ready for a walk out,” warned Derek Harris in the video. 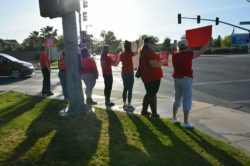 School administration and MUSD School Board members attended the walk-ins Wednesday and largely voiced their support of the walk-in demonstrations and increased state-funding. However, Board Member Torri Anderson could not comment on what the board’s position could be if MUSD teachers decide to strike. Anderson said a discussion between the board would need to take place along with its attorney before their stance could be announced. “We’ll see what the next step is, but our teachers and our students deserve a world-class education so it’s time for the state to support that and really do what’s best for our students,” Anderson added. 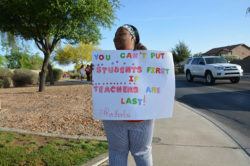 Many frustrated teachers targeted Arizona Gov. 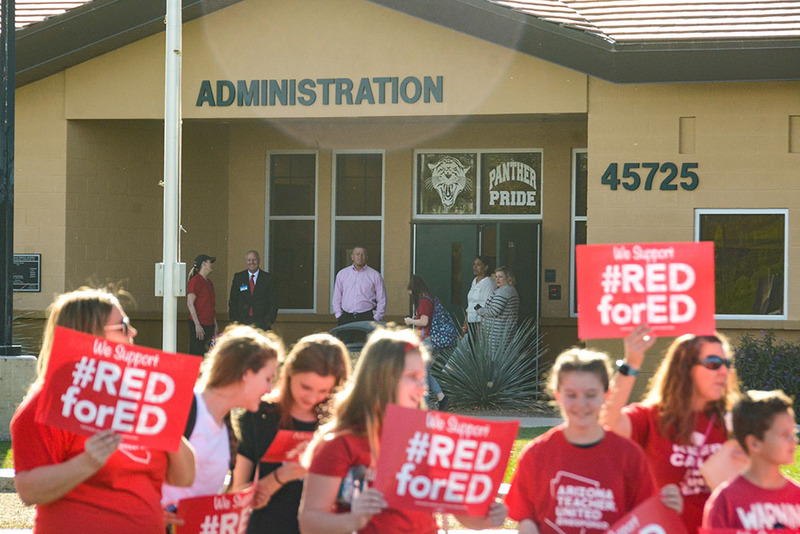 Doug Ducey during the demonstrations and indicated support for the impending walk-out. Teachers are upping the ante in a statewide campaign to increase pay and improve education for their students. “Walk-ins” are slated to occur at schools in the Maricopa Unified School District April 11. Teachers will meet in front of campus 30 minutes before they’re contracted to begin the day. (Read below to see the times at each school). Some will carry signs, and most will be wearing red. All will walk into the school together before school begins. 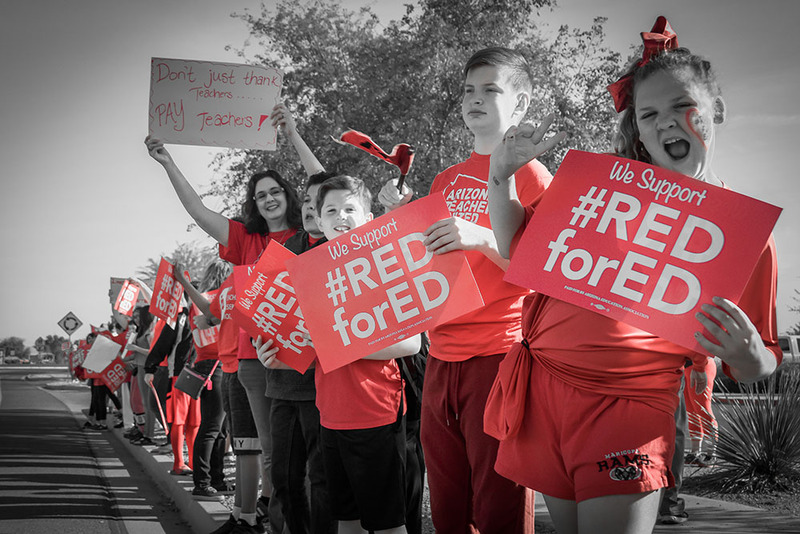 The #RedForEd movement began in early March in Arizona. 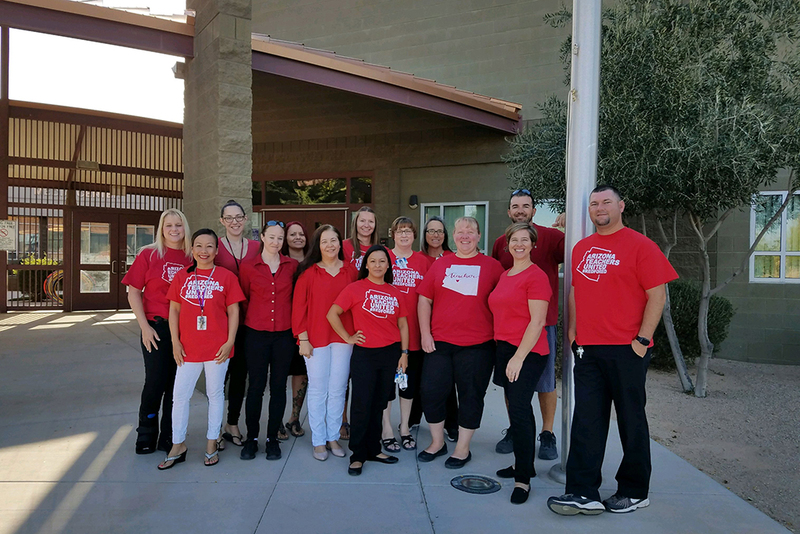 Teachers wore red to school as a show of solidarity. 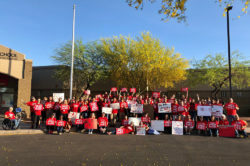 But now Arizona Educators United (AEU) — the coalition of teachers, administrators and support staff who support the movement – are strategizing ways to force the hand of legislators, and most importantly, their governor. “(Gov. 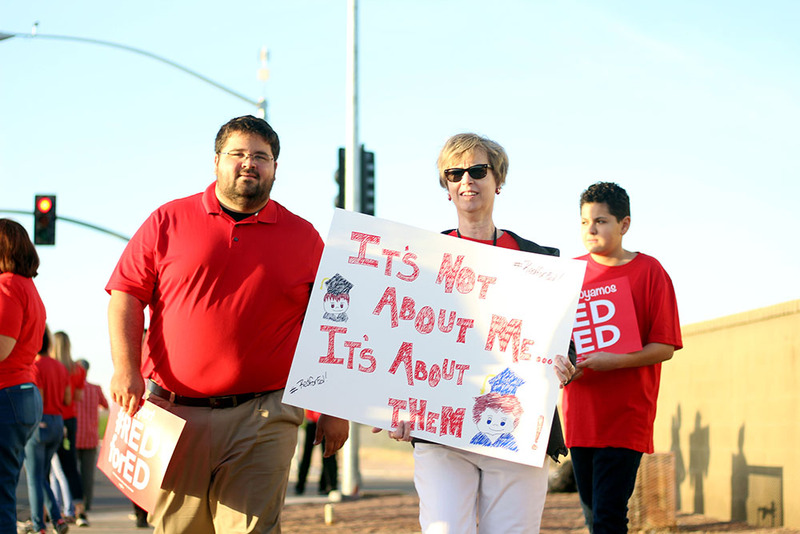 Doug) Ducey needs to do something,” said one MUSD teacher April 5. A group of around 25 crimson-clad teachers met inside a classroom after school at Santa Rosa Elementary this week to schedule the walk-ins, discuss goals and, at times, voice their frustrations. 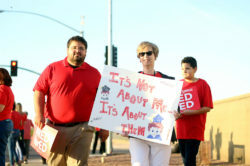 Arizona public school teachers are among the lowest-paid in the nation and all eyes are on other states, like West Virginia and Oklahoma, who have protested their own working conditions and low wages with some success. 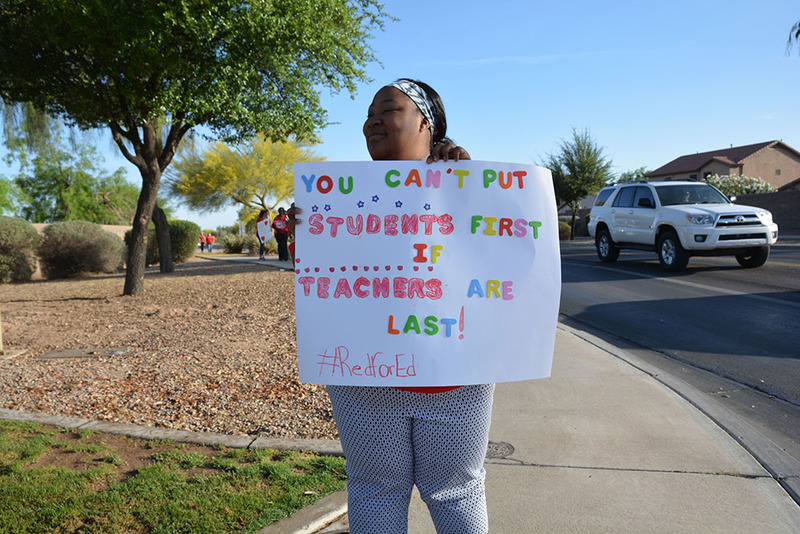 Teachers in some schools in the Valley walked out for one day last month, but Arizona educators teach in a right-to-work state, and many realize the risk a strike could bring them. 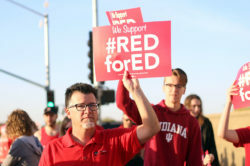 Some local teachers said they’d be on board and viewed walk-ins as a way for the AEU to measure the movement’s manpower in case demands aren’t met. AEU encourages parents, community members and students to support teachers April 11. However, AEU advises teachers against speaking to the community during school hours about the event. Teachers also cannot communicate details about the walk-in via their district email. Representation from each MUSD school site was not present at the walk-in meeting this week, so the April 11 events cannot currently be confirmed at every school. If you are a parent or community member, please contact your school administration to confirm whether your child’s campus is participating. Maricopa High School and Maricopa Wells Middle School are confirmed to be participating so far. Santa Rosa Elementary: 7:30 a.m.
Pima Butte Elementary: 7:30 a.m.
Maricopa Wells Middle School: 8 a.m. Representatives from Santa Cruz Elementary and Desert Wind Middle School have not indicated whether they will participate. Maricopa public school teachers joined a statewide movement Wednesday in protest of low teacher pay. “This is not an indictment of our local schools; it’s an indictment of Arizona as a whole.” — Jason Goodwin, Maricopa teacher. “Teachers definitely need to stick together. 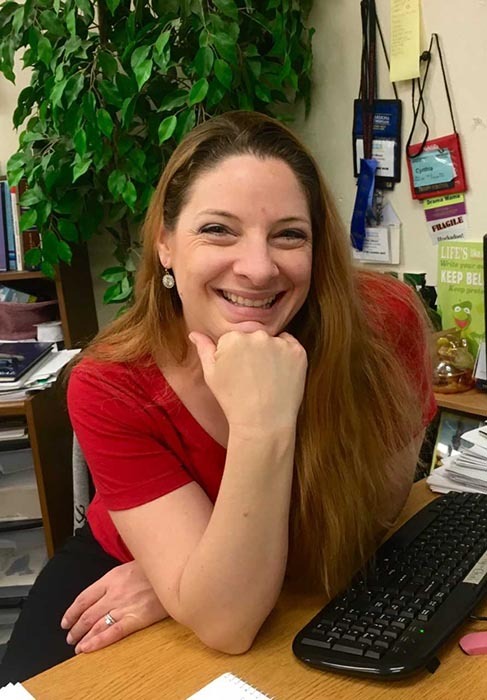 We need to make education better for our students,” said Maricopa High School drama and theatre teacher Cynthia Calhoun. Online organizers describe the movement as a show of solidarity, first inspired by a nine-day, statewide teacher strike in West Virginia that led to a wage increase. Brian Burkett teaches government and economics at Maricopa High School. 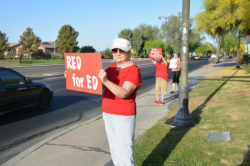 He wore red to support public educators whom he said are “underpaid and underserved” by Arizona Gov. Doug Ducey. Arizona ranked last in the nation according to a report published in 2017 by the National Education Association that compared teachers’ salaries in the United States in 2015-16. Instructional staff ranked 49th. Public school teachers received a 1 percent “raise” last year by the state. However, it’s often not viewed as a wage increase at all by educators like MHS AP history and government teacher Jason Goodwin, but instead a debt owed to them after the state reallocated education funds elsewhere during the recession. “I’m wearing red today because in Arizona our pay is so low. It doesn’t matter what district you’re talking about. 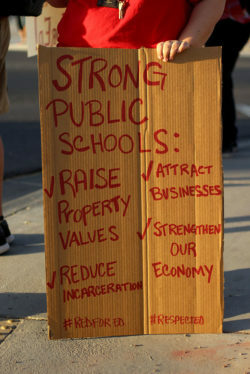 This is not an indictment of our local schools; it’s an indictment of Arizona as a whole,” Goodwin said. 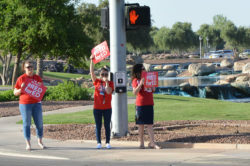 The Maricopa Unified School District Governing Board voted last year to increase salaries for all employees by 3 percent and successfully passed an override measure in 2016 that afforded the district 50 additional teachers. But, even with a raise, retention is still an issue as many teachers struggle to make ends meet. MHS AP world history teacher Tyler Miller remembers watching dedicated teachers leave the industry during his rookie year in the classroom. He believes the Red for Ed movement will spark discussions that could end Arizona’s educator exodus. As parents look ahead to the upcoming school year, they may wonder how to tell if the new teachers will be the right ones for their child. You can go online and see ratings for doctors and restaurants, but how are teachers rated? There are two primary methods to assess the abilities of a teacher. An administrator can observe the teacher and using a specific assessment tool, provide a rating for the teacher. The second method commonly used is to base the teacher’s evaluation on the test scores for that teacher’s students. Both of these methods have serious flaws. An instructional observation tool focuses on certain teaching techniques, such as proper introduction of the lesson, engaging students, linking parts of the lesson to each other, providing students with a summary of what should have been learned. Unfortunately, the content of the lesson may not be evaluated since the evaluator may not have sufficient knowledge of the subject being taught. For example, a high school physics teacher is observed by an assistant principal who was a teacher of foreign language and who has little scientific knowledge. Another example might be a fifth grade teacher being observed by the principal, whose teaching career was accomplished teaching first grade. Using student test scores to appraise a teacher’s performance is similar to evaluating a physician based on the health of the doctor’s patients. The patients are told to stop smoking, eat right and exercise more, but they refuse to listen, and they suffer from serious health problems. Students might come from dysfunctional homes, where the child does not get sufficient nutrition or sleep, or there might even be physical abuse present. With students such as those, it would be grossly unfair to evaluate the teacher based on student performance. 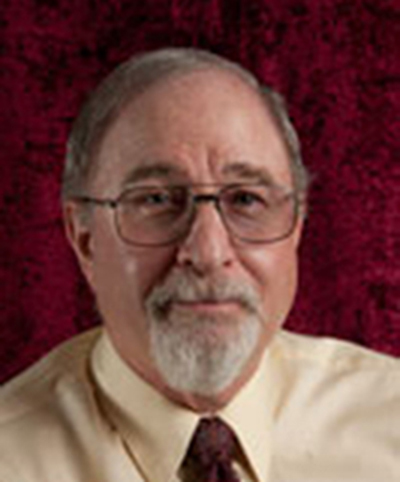 Murray Siegel is a Maricopa resident. He has a PhD in Math Ed and 42 years of teaching experience. He and his wife Sharon volunteer at Butterfield Elementary. This column appeared in the June issue of InMaricopa. Maricopa Unified School District has open positions and the money to pay them. The challenge is finding enough teachers to fill the positions. With the passage of Proposition 123 in May’s Special Election, MUSD will have additional revenue in “inflation” funds. That could allow the hiring of 16 employees, including 13 teachers, which is part of the budget discussion slated for Wednesday’s meeting of the governing board. For most schools, this is the hiring time of year. 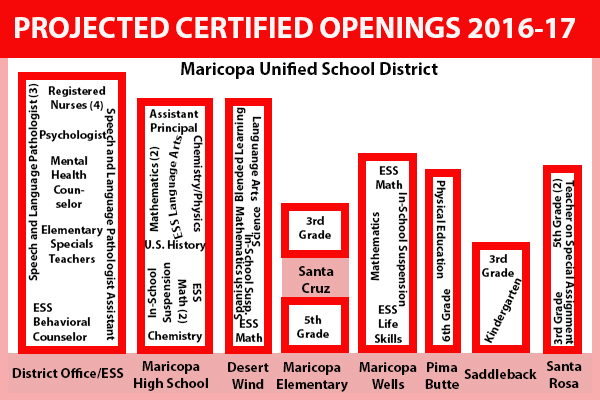 MUSD has been busily filling vacancies, but there are around 40 certified positions already needing qualified applicants. “We currently are still recruiting for a variety of general education and special education positions,” said Tom Beckett, director of the Human Resources Department. Beckett said the district is employing two new recruitment strategies this year. One of those is offering a “finder’s fee.” The district will pay any non-administrative employee a stipend of $200 for finding a general education teacher that is hired and $500 for a special education teacher or service provider hired. Also new this year, MUSD offers a relocation stipend of $2,000 for a highly qualified, out-of-state teacher hired after June 1 and $1,000 to a highly qualified, in-state teacher. MUSD continues to offer a $2,000 signing bonus for highly qualified teachers in mathematics, science and special education. The district advertises on in-state and national job boards. Teacher turnover in Arizona has been well documented in recent years. A 2014 report from Alliance for Excellent Education showed teacher attrition cost the United State up to $2.2 billion annually. In Arizona, that was $76 million. That same year, the Arizona Department of Education reported a teacher retention rate of just 65 percent. The irony is, with a growing student population, MUSD wants more teachers. It has a budget override proposal on the November ballot, mainly to be able to hire more teachers to shrink class sizes. That would be 47 more positions to fill. At Wednesday’s meeting, the board could approve a personnel list of 14 new employees, from a new dean of students at the high school to a part-time clerk. The district office and every school except Butterfield Elementary have current openings. Chestnut said Beckett had attended 10 job fairs in Arizona and four out of state in an effort to recruit more teachers. “We’re really pulling out all the stops,” Chestnut said. Current openings at MUSD schools are many and varied. 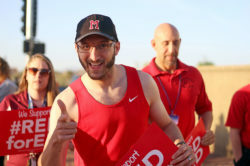 The inaugural Arizona Teachers Appreciation Fun Run is set for Saturday at Steele Indian School Park in Phoenix, and Maricopa teachers are invited to the free event. Created by the organization Keeping Teachers Teaching, the 2K run/walk is sponsored by Ak-Chin Indian Community. The event is free for teachers to enter, and the first 366 to register get a T-shirt. There will be entertainment, a DJ, vendors, free food, kid-friendly activities and a performance by FootKlan. The events run from 7 a.m. to 1 p.m. Local celebrities, professional athletes and gold medalist Michelle Perry (2005 World Championships, 100-meter hurdles) will join teachers and participants. 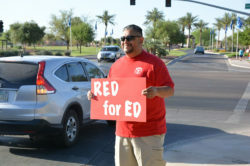 Organizer Darryl Gooden, a Maricopa resident and substitute teacher, said he started a series of morale boosting events for teachers as a way to give back. The first Keeping Teachers Teaching event was a bowling tournament for Arizona school districts joined by Arizona celebrities. Teachers from Maricopa Unified School District, with former Arizona Cardinal Frank Sanders, won the trophy. For Saturday’s event, teachers will meet at the park at 300 E. Indian School Road. Parking is in Lot C, and registration is at the amphitheater. That evening is International Jazz Day from 4 to 10 p.m. at CityScape, 1 E. Washington St. This event is also free to teachers with their teaching ID. That includes access to the VIP tent, an event poster, T-shirt, food, two drinks and a photo op with the jazz musicians. For everyone else, there is a $20 general admission fee. Parking is available in the underground parking lot of CityScape. “We honor veterans and first responders; I just thought it was time to show our appreciation for teachers,” Gooden said. Dozens of parents came in angry. Many screamed at administrators. Sequoia Pathway Academy was a scene of confusion today after several teachers walked off the job. They were apparently protesting the reported firing of two administrators. EdKey CEO Doug Pike stayed in a closed office. Parents tried to enter but police restrained them and asked for them to wait in the gym. Those reportedly let go by the charter school today were Nate Lamma, the dean of students, and Assistant Principal Diane Sylvia. “The official statement is that we are introducing a new a leader to the campus; his name is Keith Greer. He is the replacement for Jon Gentile who tendered his resignation several weeks ago,” Pike said. According to staff, the word starting going around of the “firings” at noon. When teachers found out about the administration turnover, they began sending students home. Students left in tears. Many were unaware of what was happening. “This isn’t right! This isn’t necessary!” was shouted by many parents. Most didn’t understand why this happened in the middle of a school day. Most teachers stayed and students were able to attend classes until the regular dismissal time of 2:30 p.m. for elementary and 2:45 p.m. for secondary. “Two of our best administrators were fired today,” said one teacher who did not wish to be identified. A lot of expletives were shouted at Pike as he was escorted out by police for his safety. There was police presence after word spread of the confusion at Sequoia Pathway. Pike said a community meeting is planned for Thursday at 6 p.m. in the gym. Teachers walked off the job at Sequoia Pathway Academy in protest of two administrative firings this afternoon. “Our two most valuable teachers got fired,” said one teacher, who did not wish to be identified. Those reportedly let go by the charter school were Nate Lamma, the dean of students, and Assistant Principal Diane Sylvia. Students were left waiting for parents to pick them up. Parents were shouting in anger and were especially angry the walkout happened in the middle of the day with no way for some to pick up their children. A parent forum is planned for 6 p.m. Thursday.